Many Bad Archaeologists deliberately select the evidence they place before their readers and avoid presenting anything that might weaken or undermine their case. Sometimes this goes to the point where they deliberately misrepresent Good Archaeology, fail to give the whole picture – or even fabricate evidence. It is never pleasant to accuse someone of deliberate lying. We believe that most people are honest (if, occasionally, misguided) and do not knowingly fill books with falsehoods when making extraordinary claims. Graham Hancock is on record as comparing his method with that of a legal brief: he presents the evidence that puts his client (in other words, his hypothesis of a forgotten ancient civilisation) in the best possible light and his adversary (academic orthodoxy) in the worst, whilst ignoring that which has the reverse effect. This is not the methodology of academia; indeed, it can be regarded as an attempt to appeal to the reader in the way that a talented barrister appeals to the jury. Barristers have little interest in revealing the truth, what concerns them is the acquittal of their defendant, or the conviction of their opponent’s client. However, there is certain amount of selective acceptance of evidence that verges on dishonesty. The case of the “pharaoh’s forged signature” is an excellent example of this approach. 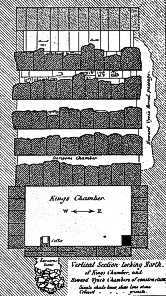 Over the main chamber in the Great Pyramid at Giza (known for centuries as the ‘King’s Chamber’), a small space above the ceiling was discovered by the British Consul in Algiers, Nathaniel Davison (1703?-1783), on 8 July 1765. In May 1837, Colonel Richard William Howard Howard-Vyse (1784-1853) and John Shae Perring (1813-1869) found that it was possible to pass a reed through a crack in the ceiling of what had become known as Davison’s Chamber and set about blasting their way upwards, using gunpowder, a procedure that would make any modern archaeologist shudder (like the surrounding area!). Four more chambers were discovered in this way, the uppermost of which had a pitched ceiling. The most significant discovery was that in the four uppermost chambers, painted marks could be seen on several of the blocks. These were the only traces of ancient writing in the pyramid and, significantly, they had not been accessible since the chambers were built. Most excitingly, they gave a royal name – Ḫwfw or Ḫnwm-ḫwfw (hieroglyphs do not show the vowels, but the name is conventionally transcribed into our alphabet as Khufu). This was a name found in various ancient lists of kings and corresponds to the fourth dynasty Σύφις (Sūphis) of the historian Manetho (late fourth to early third century BCE), who he says ‘reared the greatest pyramid, which Herodotus says was reared by Cheops’. This seemed to confirm what had been believed about the pyramid for at least 2400 years. However, claims have been made, notably by Zecharia Sitchin, that the painted marks were forged. In 1983, Sitchin alleged that Vyse and his foreman, J R Hill, crept into the chambers at night and daubed the painted texts. These claims have been effectively debunked and Egyptologists have long accepted the marks as genuine. Nevertheless, although Graham Hancock does not state that the marks were forged by Richard Howard-Vyse, in Fingerprints of the Gods, he refers to ‘a certain smell’ hanging over Vyse’s testimony and calls the quarry marks ‘dubious’. It was necessary for him to remove the attribution of the Great Pyramid to a fourth-dynasty pharaoh if he was to prove that it was built c 10,500 BC, as he attempted in Fingerprints of the Gods. In Keeper of Genesis, published in 1996, he repeats Sitchin’s unfounded claim that the Kh symbol (a circle containing several horizontal lines) is miswritten as a R‘ symbol (a circle with a dot in the centre), a mistake no ancient Egyptian would have made; photographs clearly show that the claim is false. In 1998, he withdrew the claim, admitting that the evidence demonstrated that the pyramid was built by Khufu c 2500 BC. His current position is now that, although the pyramid dates from the middle of the third millennium BC, its design is eight thousand years older (and he hints that some of the rock-cut parts of the structure may be that old). This is disingenuous stuff indeed! This rather sorry tale is merely an illustration: it would be possible to list numerous cases of writers misrepresenting evidence they could easily have checked more thoroughly. Instead of doing original research, most Bad Archaeologists often build on the claims of their precursors, giving earlier hypotheses as facts or repeating their statements without checking them. These are exactly the techniques used by the writers who developed the legend of the Bermuda Triangle. It is a phenomenon we will encounter many times on this website.